Didier Yves Drogba Tébily (born 11 March 1978 in Abidjan) is a Côte d'Ivoire professional football player. He plays for Phoenix Rising FC in the United Soccer League. He lived in Abidjan until he was 5 years old and then he moved to France to live with his uncle, Michael Goba. His uncle had been a professional football player in Cote d’Ivoire. In the 2006/07 season, he was the top scorer of the English Premier League with 20 goals. Drogba played for Le Mans at Ligue 2 in 1998. He moved to Olympique Marseille in 2003 and scored 29 goals in the next season. 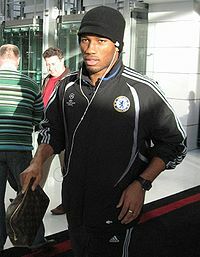 In July 2004, Drogba moved to Chelsea in the English Premier League. Drogba stayed at Chelsea for about 10 years. Drogba was a member of Côte d'Ivoire’s national team and was their top scorer with 65 goals in 105 appearances. Wikimedia Commons has media related to Didier Drogba. ↑ "Home - Official Site - Chelsea Football Club". ChelseaFC. This page was last changed on 11 February 2019, at 20:34.